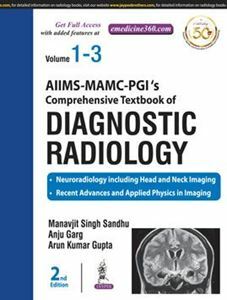 AIIMS-MAMC-PGI’s Comprehensive Textbook of Diagnostic Radiology includes three volumes. Volume 1 is a treatise of the two most elaborated subspecializations of radiology namely, Neuroradiology including Head &Neck Imaging and Recent Advances & Applied Physics in Imaging. Neuroradiology has evolved tremendously in the last two decades in both diagnostic and interventional domains which has remarkably changed the way we approach many neurological disorders. This volume makes an attempt to comprehensively covers all aspects of these subspecializations with utmost precision and care by authors having several years of training and vast experience in their subject. Volume 2 has three very large topics which cover majority of diseases affecting any population, i.e. Gastrointestinal and Hepatobiliary Imaging, Genitourinary Imaging, and Pediatric Imaging. As is true for any organ system, each of these topics needs focused in-depth attention in order to be able to produce a worthwhile document. Volume 3 deals with two very important subjects in the day-to-day practice of any radiologist, i.e. Chest & Cardiovascular Imaging and Musculoskeletal & Breast Imaging. Each of these in itself is a vast subject with its own unique issues related to imaging equipment, techniques, disease patterns and advances in management. Focuses on research by featuring research articles from renowned professionals.